Grab tools, bonuses and powerups without getting hit by trucks pacman style. Drive and navigate your fast car through 50 level mazes of pure excitement. 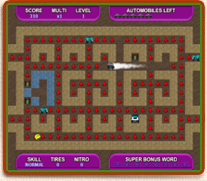 A variety of features included like Nitro Boost that puts the pedal to the medal to give you power acceleration, Maze Warp that lets you catch the train to surpass the current level, Invisible Auto that will make you indestructible for 20 seconds, Meters will rack up points plus many more. Grab tools, bonuses and powerups without getting hit by trucks pacman style. ...... Hit the Go Traffic Lights to send the trucks in a tailspin so you can knock them back home and the Stop Traffic lights will freeze the trucks for 15 seconds. Also there are special bonuses like moving tires and super bonus words that will give you free life opportunities. Moreover there is 3 skill levels from easy to hard, full screen or window mode, keyboard or joystick control all wrapped up with fresh graphics and driving music. After your game is over submit your score to the database and be ranked against players from around the world and view the best scores within the game. Do you like to trucks? If you do, it suits to you very much. The old amusing arcade racing game is back! Qweas is providing links to Cars vs Trucks 1.0 as a courtesy, and makes no representations regarding Cars vs Trucks or any other applications or any information related thereto. Any questions, complaints or claims regarding this application Cars vs Trucks 1.0 must be directed to the appropriate software vendor. You may click the publisher link of Cars vs Trucks on the top of this page to get more details about the vendor.